Provides many options for copying the contents of one folder to another. CopyFolder 1.7 is a filtered folder copier that copies your files in their original formats. As a result, you can access your copied files without using this program. After using the preview feature to generate a list of files to copy and making any adjustments to this list, you can press the Copy button and then do something else while this program runs. Unless you tell it otherwise, CopyFolder will run unattended after initial validation until it copies all the files it can and presents a summary report. 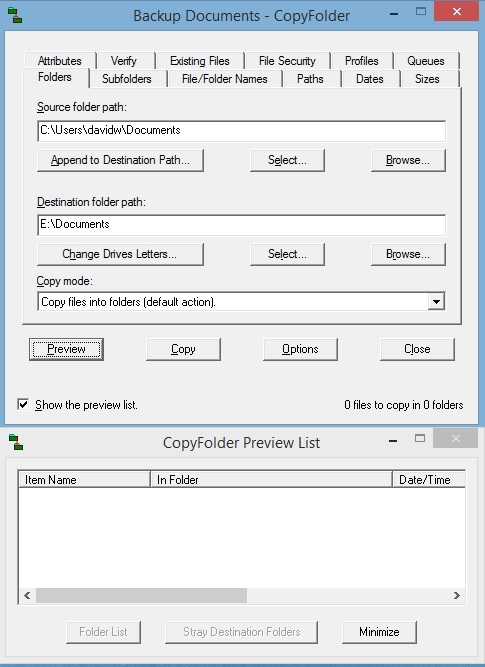 CopyFolder provides many options for copying the contents of one folder to another. Subfolders can be filtered by paths, names or patterns and may or may not include their subfolders. File names can be filtered by patterns. Files can be filtered by paths, dates, sizes or attributes and may optionally include typos. It has various overwrite and dispose options, including file versions. With an external compare program, text files can be compared before copying to see differences. Files can be compared after copying to verify accurate copying. It can delete destination files that are not in the source folder. It can copy a folder tree without copying files. It includes a preview feature. It can be used as a local backup or synchronizing program. It allows defining queues of profiles, which are sets of settings. It uses an adaptive memory area for faster copying of large files. Under certain circumstances, it can copy file-security settings. If I cocmnuimated I could thank you enough for this, I'd be lying.